Cybernetic Revolution is a Trap that doesn’t take the name of the set Cybernetic Revolution. A 1-for-1 Fusion summon trap for Cyber Dragons. Any “Cyber Dragon” can be tributed, and with the monsters that consider themselves Cyber Dragon on the field, meeting this requirement is easy. Any Fusion that lists Cyber Dragon as a material gives you options for the field, obviously Cyber Twin and Cyber End are two of the better choices due to their flat ATK upon summon, while the other forms need materials to make them big. Can’t attack directly isn’t too big of an issue, and destroyed during the End Phase isn’t bad either. Use that monster to smack an opponents monster and open them up to a direct attack with other monsters, and you still have the monster in the grave at the end of your turn for things like Monster Reborn later on. I think Cyberload Fusion is a better card, but this card can use less resources for somewhat the same effect. I like this card a lot. Cybernetic Revolution is a simple Normal Trap Card that costs 1 tributed Cyber Dragon (or something named Cyber Dragon on the field) to Special Summon a Fusion Monster that lists a Cyber Dragon monster as material. This is not a proper Fusion Summon, it is destroyed during the End Phase, and the monster cannot attack directly. Other than that, use effects, Link it away before it dies, push for big damage on a monster. It’s cheaper than polymerization, but the thing cannot be revived later. You can only activate one per turn, but you should only really be running one anyway. Cybernetic Revolution can get the job done and the artwork is fantastic, but Cyber Dragons have a lot of options for Extra Deck plays, and this is just another good one. The final Cyber Dragon card we look at this month is the one named after the set Cyber Dragons originally came out in, Cybernetic Revolution. 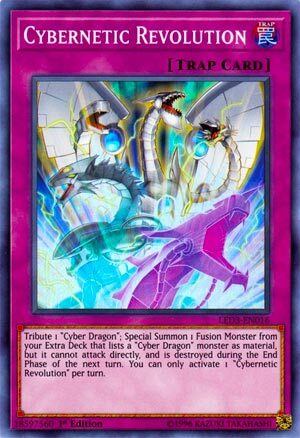 Cybernetic Revolution is a Trap Card that lets you tribute one Cyber Dragon to Special Summon a Fusion Monster from your Extra Deck that lists a Cyber Dragon monster as material, but it cannot attack directly and is destroyed at the End Phase of the next turn and you can only activate 1 Cybernetic Revolution per turn. Nice way to get a big body on board, swapping Cyber Dragon or one of the many cards that treat itself as Cyber Dragon for more than likely Cyber Twin Dragon or Cyber End Dragon to get attacks on two monsters with 2800 ATK or pierce with 4000 ATK. It could help quickly get to Eternity Dragon to eventually destroy it and get that GY effect at a later moment. If you want, you can also Link away with whatever Fusion you summon before it dies at the end of the next turn. Cybernetic Revolution is a cute card that might be worth trying as a 1 of in some Cyber Dragon decks since Cyber Dragon Core searches for it. Art: 4/5 Evolution of the Cyber Dragon. Cybernetic Revolution is an interesting spin on a Fusion take for the Cyber Archtype. You Tribute a Cyber Dragon to Special Summon a Fusion Monster from the Extra Deck that lists a Cyber Dragon Monster as material. Initially, note this is a -1, you’re giving up this card and the original Cyber Dragon for one new Fusion Monster. But, assuming you win in this turn, or it generates you some mass advantage afterward, it could be okay. Said Fusion Monster can’t attack your opponent directly, and is destroyed during the End Phase, so let’s see here…Cyber Twin will give you two 2800 attacks (assuming your opponent has two Monsters out) and Cyber End (the other logical choice) would give you one 4000 attack with Trample. Throw in some Limiter Removal, maybe a Megamorph, this could end up being enough to win you a game. You can always attack with the Monster too (or not) and instead choose to do a big XYZ Summon, Tribute it for something else, it’s a free Monster to use for a turn, after all, even if you can’t directly attack with it. This is one of those cards that’s good, just not quite good enough, in my opinion. I think there’s enough ways and assets for the Cyber player to do these things without this. Art: 4/5 Cyber End in the background, see some electricity fizzing around, the different colored Cyber Dragons around in the front are cool.